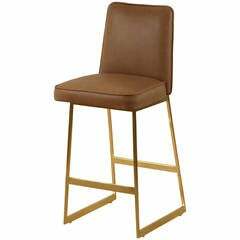 Model: 4x PT48 counter-height and swivel stool Seat: Leather Seat color: Pigeon Base: PT48 base, with swivels and hand cast brass Base finish: Brushed Brown Dimensions: 52 x 50 x 78 cm (seat height 66 cm) (W x D x H) 20.5 x 21.7 x 30.7 inch (seat height 25.98 inches) Handmade, available to your order Belgians Pieter Compernol, Stephanie Grusenmeyer and Austrian Florian Gypser designed this chair. You might notice similarities with Paul Kjaerholm's PK9 Tulip chair. No wonder, he is one of our favorite designers. We were naturally inspired by our very own PT2 table base as well. The chair's base is sand-cast by hand in either brass or bronze by Italian bronze-master Armando and his Team. Armando is hitting 80 and is truly old school, he even used to work for Salvador Dali!! He is very much living proof that when we live our passions we stay young! Lead-time 12 weeks This chair model is available to order in either dining-table height, counter-height, and bar-height. There are stool and swivel version available. Important notes: Three legs, not four or five Our chairs have only three legs, like all other three-legged chairs they need some getting used to. We naturally tested our chairs extensively and they are perfectly balanced and perfectly strong. However, we'd advise not to Stand on them, finding your balance standing-up might be challenging on 3-legged chairs. P. Tendercool's chairs are chairs, not ladders. Brass or bronze base Our P. Tendercool chair bases are made from solid sand-cast Brass or Bronze. The chair-base has been cast, brushed and finished by hand. This is visible. Air-bubbles from the casting process, weld-marks or brush lines will be present: our chairs are Made by Hand, one by one. There might be minor height or angle differences between chairs...P. Tendercool chairs are, like all our creations, never computer-perfect, nor made by Robots. We do apply a neutral colored primer on the chair bases but your chair will 'patinate' over time. This oxidation process – while slowed down due to the applied primer - is natural, inherent to Brass and Bronze, and is indeed, intentional. Oxidation marks will never be considered a 'defect'. Scratches Brass or bronze are metals. Metals can scratch or cause scratches. We mounted protective patches on the chair, but when you move the chair try not to forget that floors generally do not like metal. You may want to opt for our handstitched leather socks in the same color as the seat. Our finishes withstand every-day use, but as cars, they are not 100% scratchproof. Leather We hand-pick our leathers from local tanneries and do love a natural look. We chose hides which show 'traces of the beast': some necklines and marks remain visible. We buff the leather for a soft natural look and apply an oil finish: We like the traces of age and usage, and compare this to the look of horse-saddles, weathered belts or really great leather shoes, worn for years. Antique-dealers call this 'patina' and our chairs will become witnesses of decades-long use. It is up to you to apply some neutral saddle oil or cream to maintain your chairs. All this to mention we do not 'Plastic-coat' our leather. Our chairs, as our tables, are never perfect, they look natural and will age with grace. P. Tendercool Who? Cross Cultural Creations...Belgians in Bangkok Belgians Pieter Compernol and Stephanie Grusenmeyer are founders and design directors of P.Tendercool, and work with talents from around the globe. What? Bespoke Furniture – Haute Manufacture We create bespoke. handmade, made-to-order furniture for some of the most discerning interior designers, private clients and hospitality leaders. P. Tendercool creates tables of all shapes and sizes, leather chairs & stools and recently developed their first collection of sofa's and daybeds. We use antique or reclaimed hardwood and honor traditional crafts: sand-cast bronze and brass, true French polishing, home-made wax and the works. We do not participate at any design or furniture fairs, and don’t work through resellers. Our creations are market-fresh, only available at our gallery or our open workshop in Bangkok... and online. We design at our own pace and present new creations only when we feel we are ready. Why? We make furniture we would buy ourselves. If we didn't like our own creations why would you love them? We strive to be transparent in everything we do: we offer great photos of finished creations, images of production process, we show how we crate and create, how we handle shipping and offer videos on how to unpack, mount and maintain our creations. We hate to be disappointed when we buy online, and know you do too. We keep our promises and respect our lead-times. What you see is what you’ll get. Plum counter stool celebrates the luxury and opulence associated to this bold color, highlighted by the faux leather that composes it, synonymous of class and exuberance. Set of four industrial counter-height bar stools. Diameter of the seats is 13 inches. Elysian counter stool by Lawson-Fenning. Also available to order COM/COL. Davis counter stool was named after the sea along the coast of East Antarctica, representing its colors and its ripple through the forms that convey movement.